Mast made of painted ash wood (2.9 cm Ø). Linkage made of fibreglass, hub made of plastic. Cover 100% polyester (fabric weight approx. 250 g/m²). Headpiece made of wood, steel tipped. Ø 2 m, height 2.33 m. Weight 3.5 kg. Delivery without parasol stand. Umbrellas by Glatz. Quality Products from Switzerland Since 1885. Since the sun is constantly in movement, a parasol can hardly perform its function to protect against the sun without continually adjusting its position and inclination. The Thurgau umbrella maker Glatz was the first to recognise that the problem could best be solved with a well-thought-out mechanism. The result led to a series of patents and a success story lasting more than 100 years, part of which is the "Alexo" joint, still produced today after being introduced in 1931. The crown of every balcony. The gear rim joint made of nickel plated brass allows the parasol to be tilted at almost any angle by loosening a large wing nut, and to completely collapse the painted ash wood mast to half its height for transport or storage. 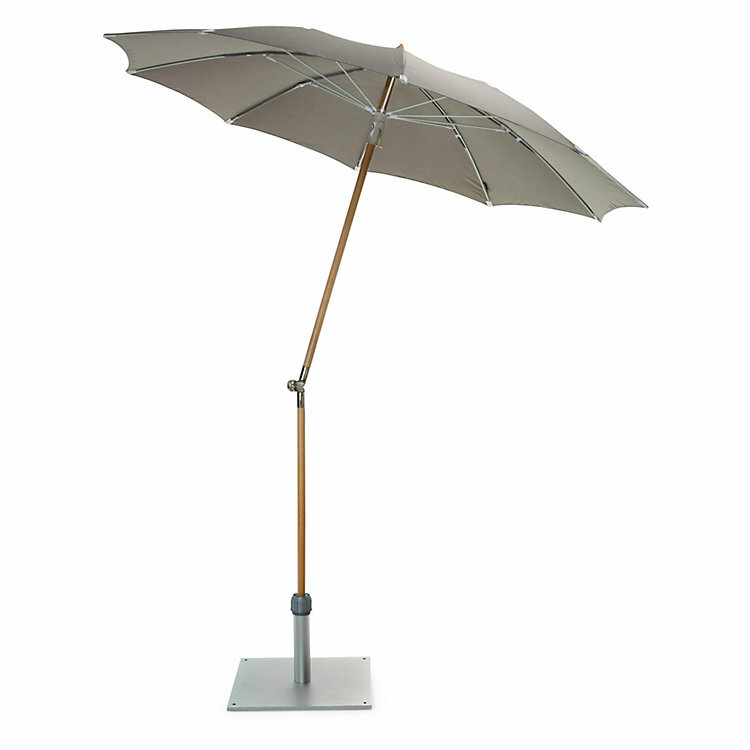 The parasol is covered with a durable polyester fabric. The fabric is lightfast (Blue wool rating 7) offers UV protection with a factor of 50+ which corresponds to the light protection factor for cosmetic sunscreens. The fabric is water and dirt repellent, with leather trimming to protect the edges. The support struts are made of fibreglass; the hub is unfortunately now made of plastic. The wooden headpiece is a detail very typical for Swiss parasols. It is fitted with a little protective cap made of metal. This tip has become widely known as the "Glatz-Spitz", which aside from its instant recognition factor protects the parasol during transport or storage.